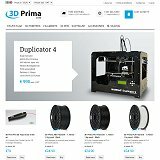 European distributer and reseller for 3D Printers and filaments. Wide range of filaments like ABS, PLA, Taulman Nylon, NinjaFlex, Laybrick, Laywood and many more to choose from. Free shipping within EU for order above EUR 100 in value.